While many can hardly imagine life before Google gave us instant access to search the knowledge of the ages, at least one forward-thinking tech genius is committed to preparing to help us all imagine what life after Google might look like. 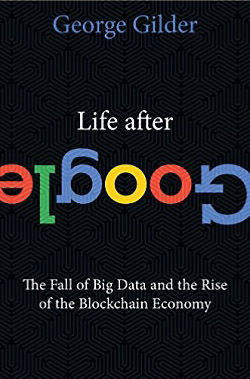 Mr. Gilder has done average 'non-techie' people (like me) a great service writing this book exposing the fatally-flawed premise of Google's hierarchical 'system of the world' and unveiling the soon-arriving heterarchical or 'blockchain' system. Today Google is the world's premier information search tool, but along with it's highly-used "free" services it has also opened Pandora's Box and a dangerous, unsecured computer world - according to technologist-philosopher-economist George Gilder. Over the last twenty years we've witnessed the meteoric rise of tech giants including; Google, Apple, Facebook, Amazon and Microsoft who now dominate the global news and financial markets by offering countless high-tech gadgets and "freebies" to the masses who are often willing to give up their time, privacy and security for convenience. The result: your identity, your assets and your future are at high risk from a system so fragile that virtually no individual or business is secure from cyber-attacks. First it was the big retailers, like Target, whose databases were hacked. Then the big banks, like Citibank and JPMorgan. Next our top intelligence agencies - like the CIA and NSA - had countless national secrets stolen by foreign hackers. Then in the fall of 2017, the giant credit reporting agency Equifax lost 136 Million social security numbers. Just a week later, we learned our nation's Wall Street watchdog, the SEC, was hacked LAST year and thieves now have information which could be used to manipulate stock prices. What next? Could we wake up tomorrow to discover a trillion dollars missing from the banking system? What would you do if YOUR assets were suddenly frozen, or your identity stolen? Is anything private or safe any longer? Thankfully, according to Gilder, the creation of a new system is already in the works, radically improved from the present internet architecture. It will be as different as comparing 2-dimensional life on paper with 3-dimensional real life! By Gilder's assessment, the Internet has yet to deliver on its biggest promises of providing a secure, ad-free educational tool. Today's Internet is cluttered with unwanted ads, bots and malware. "Instead of putting power in the hands of individuals, it has become a porous cloud where all the money and power rise to the top," writes Gilder. Mr. Gilder identifies the primary culprit as the world's second largest company, Google, who "is not just a company, but a system of the world...who believes the human mind is a sub-optimal product of random evolutionary processes...that machines can 'learn' in a way comparable to human learning...a silicon brain, or 'Deep Mind'...this new digital world may not need you anymore." The Silicon Valley is currently suffering a "nervous breakdown", according to Gilder, "manifest by delusions of omnipotence and transcendence." Ironically, George writes, "the security system has broken down just as the computer elite have begun indulging the most fevered fantasies about the capabilities of their machines." Mr. Gilder also brings to light the political ideology and technological vision driving Silicon Valley as primarily "neo-Marxist". George draws a comparison between today's tech revolution and the first industrial revolution, which Karl Marx viewed as the climatic industrial breakthrough that would solve the economic problem of scarcity by wealth redistribution. "The neo-Marxism of today's Silicon Valley titans repeats the error of the old Marxists in its belief that today's technology - not steam and electricity; but silicon microchips, artificial intelligence, machine learning, cloud computing, algorithmic biology and robotics - is the definitive human achievement." Gilder says the original Internet architecture sufficed when it was primarily used for displaying Web pages, sending emails or hosting discussion forums, when everything was "free" and did not serve as a vehicle for financial transactions. However, with the rise of Amazon, Apple, Paypal, etc. the industry sought safety in centralization. The problem is that "centralization is not safe and it is time for a new information architecture for a globally distributed economy," says Gilder. Gilder's sweeping understanding of the history of information systems identifies Sir Isaac Newton as the first inventor of information theory. Newton established both a Newtonian system of physics and an economic Gold Standard which served as a mathematical and financial plumb line for centuries, facilitating the expansion of free commerce. "In the Google era, Newton's system of the world - one universe, one money, one God - is now in eclipse. His unitary foundation of irreversible physics and his irrefragable golden money have given way to infinite parallel universes and multiple paper moneys manipulated by fiat," explains Gilder. "Three hundred years of Newtonian prosperity have come to an end..."
"A system of the world necessarily combines science and commerce, religion and philosophy, economics and epistemology (theory of knowledge). Google is the first company in history to develop and carry out a system of the world...yet I believe the Google system of the world will fail, indeed be swept away in our time (and I am 78!). It will fail because its every major premise will fail," says Gilder. Google's theory of knowledge ("big data") assumes that the search for knowledge by human brains can be replaced if all of the data in the world can be compiled in one place and algorithms to analyze them can be developed. "Ultimately the Artificial Intelligence (AI) priesthood maintains that the human mind will be surpassed...in all ways...AI can know better than we do what will satisfy our longings," states Gilder. This philosophy attempts to lay an axe to the root of human creativity, free will and man's uniqueness as created in God's image. "Such a vision is not only deterministic but ultimately dictatorial. Google may talk a good game about privacy, but private data are the mortal enemy of its system of the world," warns Gilder. "Finally, Google proposes an economic standard, a theory of money and value...radically opposed to what Newton wrought by giving the world a reliable gold standard. Everything Google offers to its 'customers' is free...if your business plan is to have access to the data of the entire world, then free is an imperative." "So, what's wrong with free?" asks Gilder. "It is always a lie, because on this earth nothing, in the end, is free... instead of paying with the fungible precision of money, you pay in the slippery coin of information and distraction." Mr. Gilder says Google's "communications first" philosophy sounds good and has served us well for many years, but in practice "free" means insecure and unstable. Googles' search service will continue...but its insidious 'system of the world' will be swept away," concludes Gilder. "Google's security foibles, it's 'aggregate and advertise' model, its avoidance of price signals, its vertical silos of customer data, and its visions of machine mind are unlikely to survive the root-and-branch revolution of distributed peer-to-peer technology, which I call the 'cryptocosm', writes Gilder. In Chapter Five Mr. Gilder lays out ten rules of the coming cyrptocosm, which is now growing from the bottom-up as a cooperative - the exact opposite of Google's hierarchical architecture. "The first rule of the cryptocosm is the barn door law: Security first...The second: Centralization is not safe"... the other rules include; "Nothing is free"... "Time is the final measure of cost" ... "Stable money endows humans with dignity and control" ... "Private Keys are held by individual human beings, not by governments or Google." "Whereas money in the Google era is fodder for a $5 trillion-a-day currency exchange...[in the cryptocosm] you will command unmediated money that measures value rather than manipulates it. Whereas the Google world is layered with middlemen...you will deal directly with others around the globe with scant fees or delays." Mr. Gilder lays out the key thinkers, developers and companies in this emerging global blockchain movement "taking back the Net" in great detail - much more than the average layman can likely process. However, I feel like he needed to include it to back up his premise that the era of Big Data is indeed falling. The world of blockchain, blockstack, bitcoin and other cryptocurrencies is pretty hazy for most consumers and investors. But Gilder does a good job of bringing clarity about what bitcoin is and what it is not. He believes that the world economy functioned smoothly for 300 years when we operated on a Gold Standard. He points out the fact that despite most economists rejection of a modern Gold Standard, central banks around the world continue building up their holdings of gold - illustrating that the market still functions on a de facto Gold Standard. "It was not government that decreed gold as money, rather it is only by holding gold that governments could even issue any form of money at all," declares Saifedean Ammous's book The Bitcoin Standard. As it turns out bitcoin has several qualities similar to gold, such as scarcity and store of value, but it fails as a fungible currency based on lacking a unit of account. Bitcoin's (real or mythical) creator Satoshi Nakamoto "had no understanding of currency as a unit of account. By limiting bitcoin's supply to 21 million units over a 131-year period, Satoshi designed bitcoin as a deflationary currency...bitcoin is used more as a volatile investment bet than a measuring stick or unit of account," concludes Gilder. "No other basic unit of measure - whether it's the second, the meter, the ampere, or the kilogram - changes in value with demand. They are standards based on physical constants," writes Mike Kendall, currency expert and Man on the Margin blogger. "If bitcoin cannot fulfill the required roles of currency, its long-term utility as a currency is nil." Gilder sums bitcoin up, "This bitcoin flaw represents a huge opportunity for other cryptocurrencies...bitcoin cannot fulfill its basic role as a currency. Its historical fate is to provide a haven from maniacal governments and central banks and a harbor for a great innovation, the blockchain." The Coming Economic "Great Unbundling"
"The revolution in cryptography has caused a great unbundling of the roles of money, promising to reverse the doldrums of the Google Age, which has been an epoch of bundling together, aggregating, all the digital assets of the world," writes Gilder. "Companies are abandoning hierarchy and pursuing heterarchy because...blockchain technology offers a credible and effective means not only of cutting out intermediaries, but also of radically lowering transaction costs, turning firms into networks, distributing economic power, and enabling both wealth creation and a more prosperous future." "The Google era is coming to an end because Google tries to cheat the constraints of economic scarcity and security by making its good and services free. Google's Free World is a way of brazenly defying the centrality of time in economics and reaching beyond the wallets of its customers directly to seize their time.," says Gilder. As Gilder put it in another book of his which I reviewed a few years ago, The 21st Century Case For Gold, "The source of the value of money is time - irreversible, inexorably scarce, impossible to hoard or steal, distributed with remorseless equality to rich and poor alike. As an index of time, gold imparts the accurate price signals needed for sustained economic growth and expanded opportunity." "Time is the coin of your life. It is the only coin you have, and only you can determine how it will be spent. Be careful lest you let other people spend it for you," said the great American poet Carl Sandburg. Several companies are following this path of launching digital currencies based on gold. Most formidable seems to be G-Coin from Emergent Technologies, run by serial entrepreneur Brent de Jong, who sees G-Coin as a Western version of the Chinese DigixDAO. The bullion assets behind G-Coin are tracked from the mine to the transaction on a permissioned blockchain that provides a possible model for supply chains in many industries. De Jong is...devoted to using the blockchain to make gold the "earth's most liquid currency". Gilder concludes his magical mystery tour of our fast-approaching technological future on a high note of hope for the future. "A new system of the world must exalt the singularities of creation: mind over matter, human consciousness over mechanism, real intelligence over mere algorithmic search, purposeful learning over mindless evolution, and truth over chance. A new system can open a heroic age of human accomplishment. Propelling such advances will be a shift of focus from the fruits of computation to its roots in trust and security. " Because the future belongs to those prepared for it, now is the time to listen carefully to trustworthy prophetic voices which resonate deeply within. For me and millions of others, George Gilder is such a voice. His latest book offers readers a panoramic peek into the amazing, mysterious world of high technology and the shape of things to come. It is said the physical world is a reflection of the spiritual world. I believe this to be true. In the spiritual world there is a great movement afoot to empower every man and woman... to cast off their false self to discover their true self... to see the image of God in everyone, regardless of race or religion... to reach deep within and then reach out to the neediest around us. This requires giving God's Spirit permission to rewire our brain, in much in the same way the Internet today needs rewiring to reach its highest ultimate purpose. 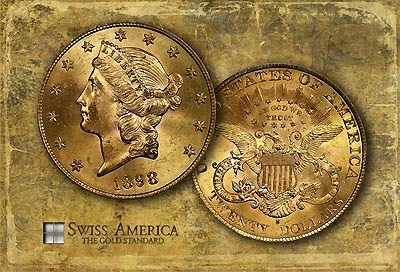 Today U.S. gold and silver coins represent a timeless store of value in a world of declining paper currencies. Swiss America clients have successfully followed their simple "Swiss Diversification Strategy" road map for over three decades. Before investing in precious metals, it is important to understand the times in which we live and the market fundamentals driving the globe back toward tangible assets - in a world awash in debt and money substitutes. SWISS AMERICA invites you to call toll-free 800-289-2646 FOR A FREE GOLD IRA EDUCATIONAL KIT or visit online at HERE . Educational Resource Tools: What Next? Disclaimer: All of the information herein is believed to be true, however errors are possible. All investments have risk.